OUT OF STOCK...Monogram houndstooth lunch tote. Easily recognizable Scottish fabric design from the 1930�s back by popular demand. This houndstooth lunch tote shown in the traditional black and white check is insulated to keep food cool. Separate removable container inside zippered bottom pouch. Outside front zip pocket. Personalization, name or monogram may be added. Houndstooth lunch tote measures 12�H x 10"W x 6� across the bottom. Insulated interior keeps food and drinks cold or hot. I absolutely love this lunch tote! 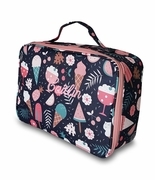 Not only was it the perfect pattern with monogram that I was looking for, it has plenty of space in the zippered/upper compartment along with a bottom compartment for the container that comes with the tote! It is well insulated & is just perfect! !